Now that I am back from my last con of the season, it’s time to start working on new things. But before I do that, I thought it was time to revisit some older costumes from before I started this blog. This cosplay is back from 2011. At the time I was really into the otome game series Hakuouki Shinsengumi Kitan. 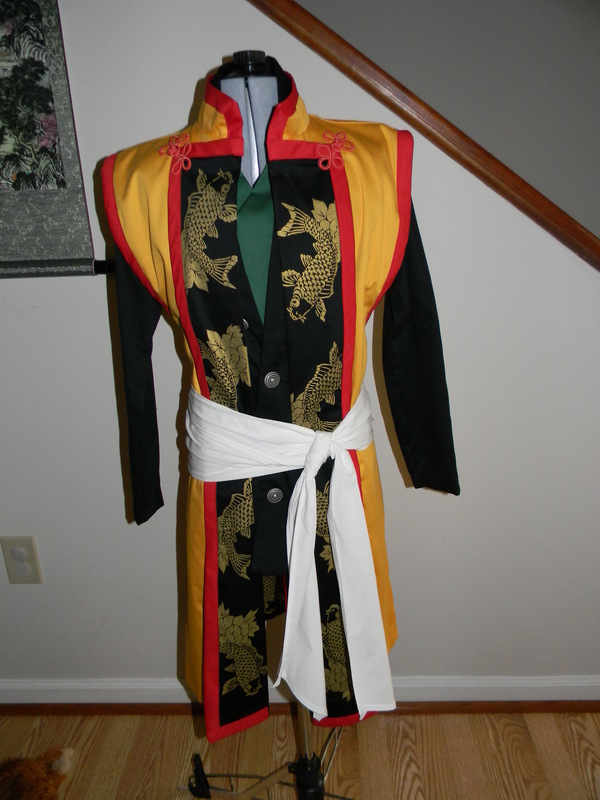 Back then it wasn’t really well known so whenever I did cosplay from it all I ever heard was “cool costume” or got mistaken for a character from Peacemaker (which focuses on the same group of people, the Shinsengumi). For those not in the know, “otome” is a type of Japanese dating game aimed at young women. You play the main character (which is usually a female and may be nameless and/or faceless) interact with your potential dating partners (anywhere between 4-12 different men with varying personalities). Depending on your choices to specific questions, you can end up with the one of the dating partners…or none at all. 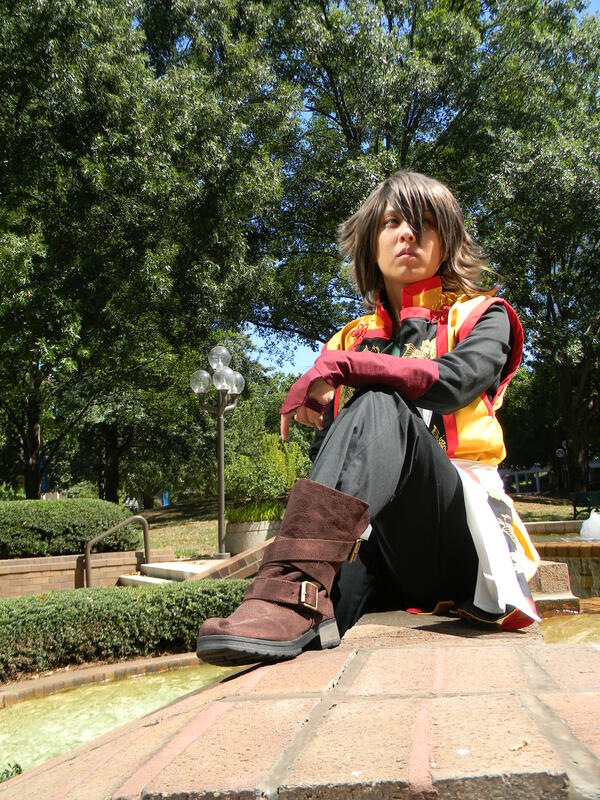 I had the opportunity to go to Anime Weekend Atlanta that year so I decided to cosplay Okita Souji, my favorite character from the game. The characters change from traditional Japanese period clothes to more Western military uniforms. I opted to do the uniform. I can’t remember the exact patterns I used, but I modified most of them. I had to add darts to the outer jacket to make it more fitted, and added the koi fish and peony flower design using screen printing. The arm guards were drafted and then sewn together although they fit a little funny. Most of the fabric I used was left over from other projects since I tend to buy more than I actually use. I have custom made prop swords but opted not to take them with me. It made the traveling less hectic since I was bringing another more involved competition cosplay. Also, they were expensive and I didn’t want the staff ruining them with their peace tying policy (which usually involved a zip tie haphazardly put on; I have had many friends have excellent props ruined this way). I haven’t worn this cosplay since AWA but I still have all the pieces. I hope one day to wear it again when I actually have a recognizable group to go with. Interesting story: I actually started working on this costume the year before. I didn’t like any of the fabric I was using then; in fact, I accidentally burned one of the pieces on my iron and had to scrap the whole thing. I picked it up again only because of the stash fabric I had. This entry was posted in Anime, Cosplay, Sewing and Crafts and tagged cosplay, hakuouki, hakuouki cosplay, okita, okita cosplay. Bookmark the permalink.